Having spoken at Live From Memphis Music Video Showcase, Brooklyn Brainery, ReMixed Four Music Video Festival and Film Athens’ Sprockets Music Video Festival, Stephen Pitalo – VJ, music video historian & expert on THE GOLDEN AGE OF MUSIC VIDEO (1976-1993) — is giving his talk on the evolution of the music video. From the early jazz films, movie musicals and early television performances, up through 70s experimentation and the 80s MTV heyday, concluding with the demise of hair metal & the rise of the Seattle sound in the early 90s, Pitalo gives insight into the growth of the music video form and the demise of the creativity. With information gathered from more than 100 interviews with music video directors and artists, Pitalo points out key events along the way, spotlighting that era called THE GOLDEN AGE OF MUSIC VIDEO, when pioneering and revolutionary filmmakers were creating the iconic music video images we still talk about today. Pitalo will be giving a special double-shot on Saturday, August 2nd. 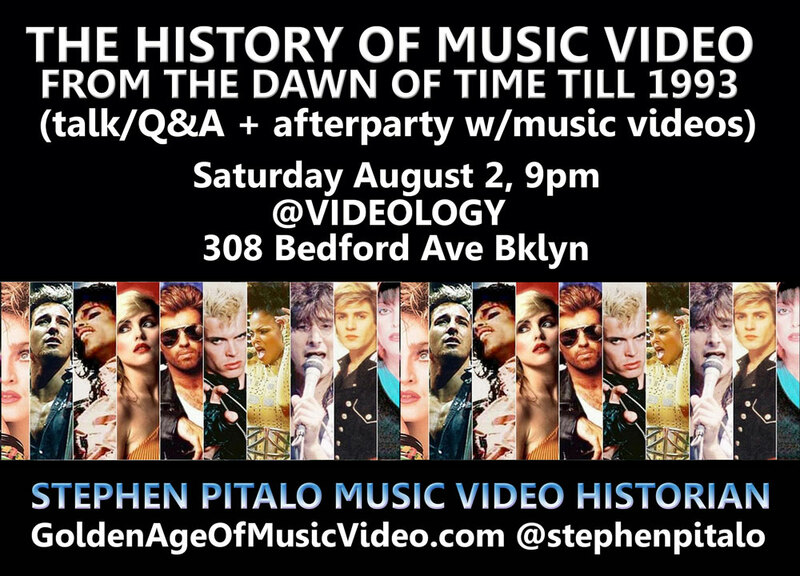 Following “The Teenage Guide to Popularity presents THE MTV 500: Videos and Trivia, Part I,” Pitalo will host his talk w/Q&A and a music video party at Videology, 308 Bedford Avenue, Brooklyn NY at 9pm. Tickets are available here. We’ll be giving away cool MTV nostalgia prizes as always — pinback buttons, heavy metal trading cards, and vintage MTV shirts, but be prepared to tweet!